Little is known about the current and historic distribution, abundance, and life history of sturgeon in the Coos watershed. Green sturgeon is federally listed as a threatened species. The longevity, slow growth, and delayed maturation of sturgeon species make them particularly vulnerable to overexploitation. Green Sturgeon bottom right image: Duane Raver, International Game Fish Assn. Figure 1. Spatial extent of sturgeon species. White sturgeon extent based on record of fish distribution and activity (ODFW 2007). Green sturgeon extent based on federally designated critical habitat (NOAA 2009). Very little is known about the abundance and distribution of both white and green sturgeon (Acipenser transmontanus and A. medirostris) in the Coos estuary. White sturgeon is thought by Monaco and Emmett (1990) to be present in the Lower Bay and Upper Bay subsystems of the project area (Figure 1). They report that white sturgeon can be found year round in both the brackish (0.5-25) and marine-dominated (>25) zones of the Coos estuary. According to Wagoner et al. (1990), white sturgeon are not known to reproduce in the Coos estuary. According to the Oregon Department of Fish and Wildlife (ODFW 2005b), the current and historical abundance of coastal white sturgeon stocks are unknown. They go on to explain that, due to highly migratory behavior, the current distribution of white sturgeon may not reflect its historic distribution. However, on the assumption that the lower Columbia River is primarily responsible for the production of coastal stocks, ODFW suggested in 2005 that the abundance of coastal white sturgeon was at low risk for failing below at least 25 percent of the historic abundance levels. 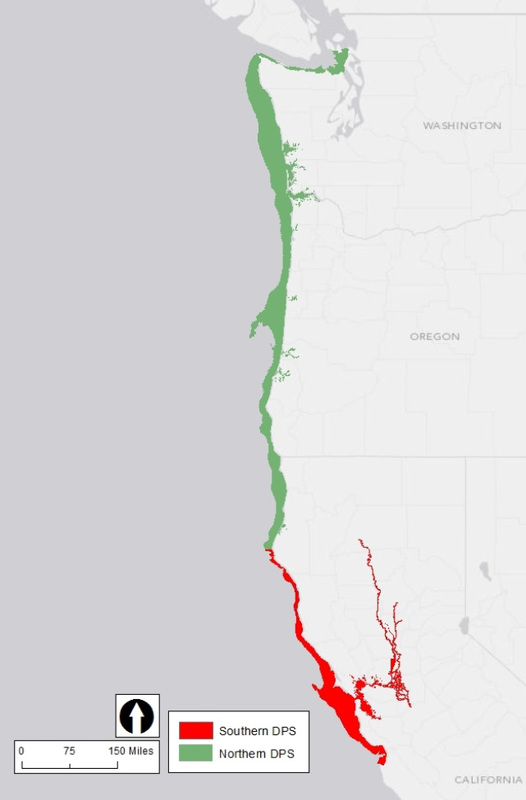 Though not abundant in any Pacific coast estuary, a small population of green sturgeon is thought to exist in the Coos estuary (Monaco and Emmett 1990, Wagoner et al. 1990, ODFW 2005a). ODFW reports that green sturgeon have been observed on rare ocassion at the forks of the South Coos and Millicoma Rivers, as well as in Isthmus Slough during their seining surveys. The National Oceanic and Atmospheric Administration (NOAA 2009) has designated critical habitat areas for green sturgeon in each of the nine subsystems. Green sturgeon are not know to reproduce in the Coos watershed (Monaco and Emmett 1990; Wagoner et al. 1990). The available data on current and historic green sturgeon abundance are inconclusive (ODFW 2005a). The Oregon Biodiversity Information Center (ORBIC 2013) lists two distinct populations of green sturgeon (Figure 2). Currently, the northern green sturgeon population is is federally listed as a species of concern, and the southern population is listed as threatened. Information about abundance, distribution, and ecology of both white and green sturgeon in the Coos watershed is sparse, and more research and monitoring are needed to address this data gap (Wagoner et al. 1990). 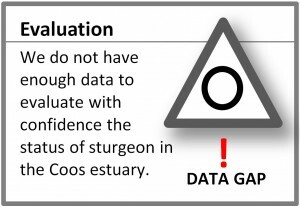 However, the status of local sturgeon populations is likely the product of several environmental and anthropogenic influences. The longevity, slow growth, and delayed maturation of sturgeon species make them particularly vulnerable to overexploitation. Excessive harvest in the Colombia River has caused the collapse of sturgeon stocks in the past (Devore et al. 1995). Prior to 1990, the recreational harvest of white sturgeon in the Coos watershed was small but increasing (Wagoner et al. 1990). 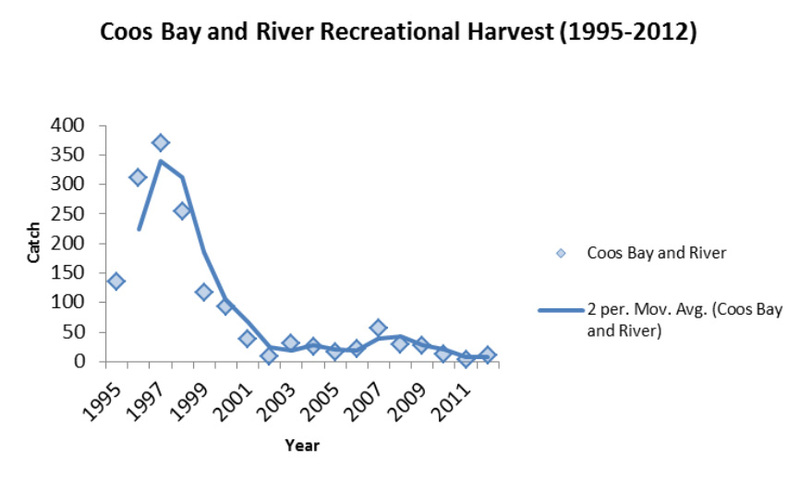 Harvest numbers increased in the Coos Bay and Coos River in the mid and late 90s, but have since followed a decreasing trend (Figure 3). Green sturgeon is incidentally caught while fishing for other species, most notably in the salmon and white sturgeon fisheries of the Columbia River (Monaco and Emmett 1990; ODFW 2005a). ODFW (2013) reports that some green sturgeons were caught in the Coos estuary by recreational anglers in the late 90s and early 2000s. This trend peaked in 1998 with a reported catch of 33 fish, and has since decreased. The most recent green sturgeon landing by a recreational angler in the Coos watershed was reported in 2003. Hydroelectric development in critical sturgeon habitat has affected sturgeon abundance in Oregon waters. The installation of hydroelectric facilities may be a significant factor in the loss of sturgeon habitat, and development on the main stem of the Columbia River may have reduced white sturgeon productivity (Devore et al. 1995). Parsley et al. (1993) explain that development on the Columbia River may have isolated historically migratory populations of sturgeon by altering the hydrology of the river, though they also suggest that the precise effects of Columbia River alterations remain speculative since existing knowledge about habitat use of sturgeon species is limited. Similarly, research suggests that spawning populations of green sturgeon in the Rogue River may be negatively impacted by the artificial flow manipulation either directly through egg and larval development issues or indirectly through a reduction in the forage base (Erickson et al. 2002). 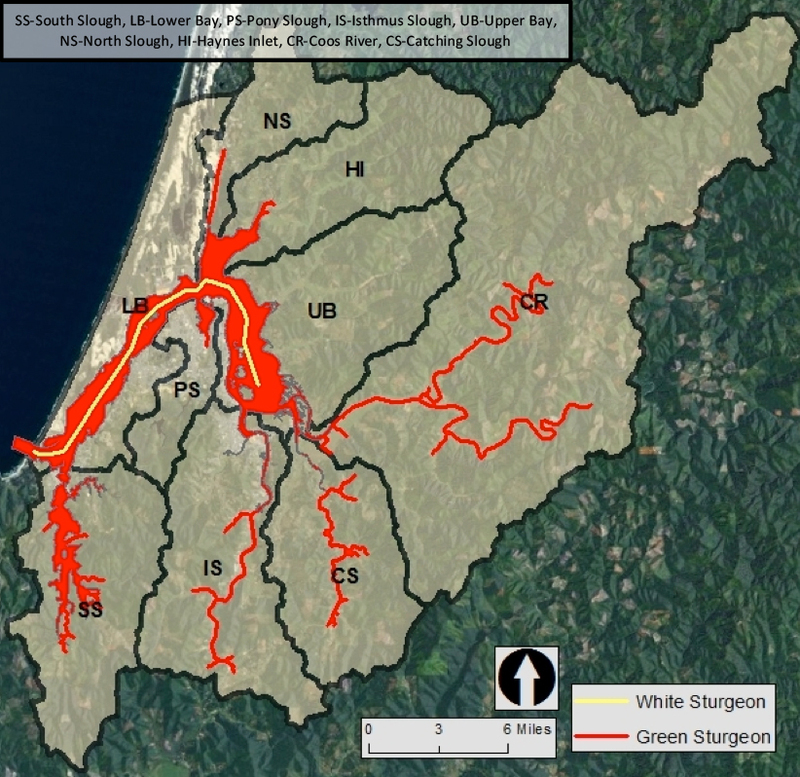 The impacts of altered stream hydrology in the Rogue River is of particular concern, because green sturgeon spawning on the west coast has been confirmed only in the Rogue (Oregon), Sacramento and Klamath Rivers (California)(Moyle et al. 1995). White sturgeon are anadromous fish that spend the majority of their life in estuaries but return to freshwater to spawn, sometimes migrating distances of hundreds of kilometers (100 kilometer = 62 miles) across different estuarine and riverine systems (UC Davis 2014). The spawning timing of these species is highly variable (Bemis and Kynard 1997). However, Monaco and Emmett (1990) suggest that white sturgeon move upstream to spawning grounds in late winter and spring, and green sturgeon move into the estuary for spawning in spring and early summer. These species spawn in freshwater, and are able to spawn repeatedly, but most females do not spawn every year (Bemis and Kynard 1997). White sturgeon take 12-15 years to reach sexual maturity (Monacco and Emmett 1990) and have a long life span that may exceeded 100 years (UC Davis 2014; ODFW 2005a). The distribution of white sturgeon is a function of age and salinity tolerance, with younger fish favoring the upstream or freshwater end of estuaries and older fish inhabiting the more marine-dominated regions closer to the Ocean (UC Davis 2014). White sturgeon adults can inhabit fresh, estuarine or marine waters over a variety of substrates, from sandy-mud to cobble (Monaco and Emmett 1990). Green sturgeon adults spend most of their time in nearshore ocean habitats (ODFW 2005a). Estuarine habitat requirements for green sturgeon include cobble for spawning and clean sand for juvenile and adults. Bemis, W. E. and B. Kynard. 1997. Sturgeon rivers: an introduction to acipenseriform biogeography and life history. Environmental Biology of Fishes,48(1-4), 167-183. Devore, J. D., James, B. W., Tracy, C. A., and Hale, D. A. 1995. Dynamics and potential production of white sturgeon in the unimpounded lower Columbia River. Transactions of the American Fisheries Society, 124(6), 845-856. Erickson, D. L., North, J. A., Hightower, J. E., Weber, J., and Lauck, L. 2002. Movement and habitat use of green sturgeon Acipenser medirostris in the Rogue River, Oregon, USA. Journal of Applied Ichthyology, 18(4‐6), 565-569. Monaco, Mark E., and Robert L. Emmett. 1990. Distribution and abundance of fishes and invertebrates in West Coast estuaries. Volumes 1 and 2. Rockville, MD: U.S. Dept. of Commerce, National Oceanic and Atmospheric Administration, National Ocean Service. Moyle, P.B., R.M. Yoshiyama, J.E. Williams, and E.D. Wikramanayake. 1995. Fish Species of Special Concern in California. 2nd edition. California Department of Fish and Game, Sacramento, CA. Oregon Biodiversity Information Center (ORBIC). 2013. Rare, Threatened and Endangered Species of Oregon. Oregon Biodiversity Information Center Institute for Natural Resources, Portland State University, Portland, OR. Parsley, M. J., Beckman, L. G., & McCabe Jr, G. T. (1993). Spawning and rearing habitat use by white sturgeons in the Columbia River downstream from McNary Dam. Transactions of the American Fisheries Society, 122(2), 217-227. Wagoner, L.J., K.K. Jones, R.E. Bender, J.A. Butler, D.E. Demory, T.F. Gaumer, J.A. Hurtado, W.G. Mullarky, P.E. Reimers, N.T. Richmond and T.J. Rumreich. 1990. Coos River Basin Fish Management Plan. Oregon Department of Fish and Wildlife, Salem, OR.